Learn how to marinate by mastering the parts of marinade, as well as the different kinds. Plus, marinade safety tips and recipes! If you’ve been around for a while, you know how I detest titling recipes as “healthy”; what is healthy for me isn’t always what is healthy for you. As 2017 begins, many of us (myself included) have resolved to live healthier lives. Since bland is often synonymous with healthy, for the month of January I am going to be covering marinades as a way of boosting flavor instead of giving you “healthy” recipes. Let’s kick it off by learning how to marinate and how marinades flavor and tenderize. A marinade is a seasoned liquid that is used to add flavor to other ingredients through soaking. Marinating is a great skill to have in your back pocket because it allows you to quickly improve your meal as well as make tougher, and cheaper cuts of meat more usable. The goal of marinating is to add flavor as well as tenderize the product. The important thing to understand when learning how to marinate is that the best way to tenderize your food is to choose the correct cooking method. Marinating will only take you so far with tenderizing. In fact, if you use too much acid (the part of the marinade that tenderizes) it can actually make the meat seize and seem partially cooked. This makes the meat tough and can possibly deceive you into undercooking it. As a result, marinades that are most effective for tenderization (high-acid marinades) should only be used for short-term marinating. Acid. This is the one that many people forget when they throw together a marinade at home. The acid not only helps tenderize, but also helps deliver the flavor of the seasonings in the marinade. The most common forms of acid for marinades are vinegar, citrus, and wine, but other foods like tomatoes, beer, or fruits can provide the same effect. Fat. Especially when you’re working with meat, having a fat (usually oil since it is liquid) helps retain the moisture that the other ingredients in the marinade may draw out. If you’re doing a longer marinade (more than overnight) you may choose to not add the fat because it will just float to the top and not be as effective. Flavorings. These can be spices, herbs, vegetables, or any other product that will increase the flavor of your marinade. Keep in mind that crushing, bruising, or chopping up the ingredients will help them release their volatile oils and flavors faster. Leaving them whole may not impact the flavor of your marinade as much. Dairy, like buttermilk or yogurt, can function as both the acid and the fat in a marinade. Using dairy in your marinades is a great way to tenderize and flavor your product. The amount of acid is low, so it is unlikely to toughen your protein, but the calcium helps tenderize the meat similarly to aging. Believe it or not, there are actually many different kinds of marinades – and I don’t mean flavors. There are 3 types that are more commonly used, and one that is only used in special situations. Instant. This is the most common way to marinate and is used for a few minutes up to overnight. Long-Term. Usually lower acid, this marinade is used for up to a week or longer. It is kept under constant refrigeration which makes the flavors in the marinade release slower. Dry. A dry marinade is the same as a dry rub or spice rub. It is a mixture of salt and flavorings you apply to the outside of a protein. The longer the marinade rests, the better the flavors will distribute into the meat. Because dry marinades rarely have acid, they won’t tenderize as well as wet marinades. They are highly effective for flavoring, though. Cooked. Cooked marinades are used when there is concern with an ingredient going bad before marinating is done. 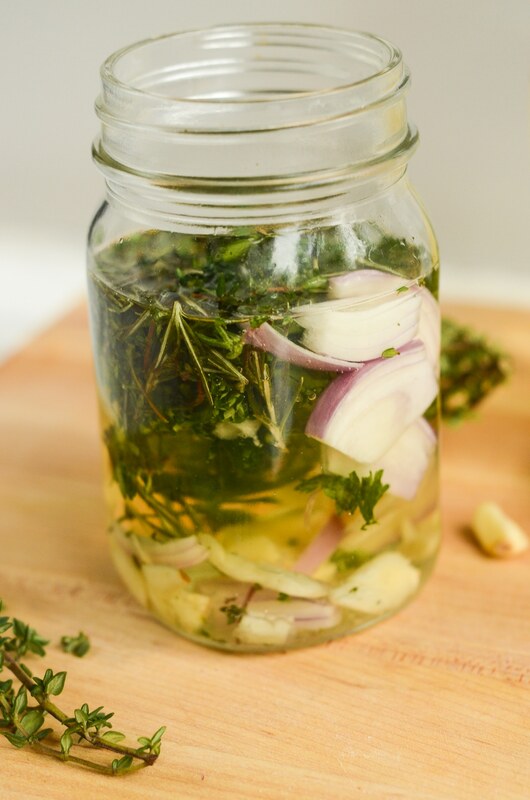 To make a cooked marinade, all the ingredients are poached to infuse the liquid. Once the heat is turned off, the ingredients are left in the pot until cooled, then everything is strained out of the liquid and only the liquid is used for marinating. This is very similar to making an infused oil. If you’re thinking about long-term marinating, I don’t personally recommend freezing your meat in your marinade. This can break down your meat and make it overly mushy and undesirable when you cook it later. Instead, freeze your marinade separately and add it to your meat when you need it. This will be a surprisingly short section, because the most important part of knowing how to marinate is knowing how to make a marinade. After that, the only recommendation I have is to completely cover what you’re marinating for maximum flavor impact. If you don’t completely submerge it, you’ll need to flip it often to allow for even distribution. The only other thing is to know how long to marinate for, and we’ll go over that next week! Part of learning how to marinate, is learning how to be safe when marinating. Before we wrap up, I want to remind you of a few food safety points. Refrigeration. If you’re marinating a protein for more than 30 minutes, it needs to go in the refrigerator. This will help prevent the growth of any food-borne illnesses. Reuse. Don’t (I repeat, DON’T) reuse a marinade. Raw meats may contain potentially harmful bacteria, and you don’t want to transfer that to a second product. Make sure to dispose of your marinade properly after each use. Sauce. Don’t use your marinade as a serving sauce. It can be used as a sauce while cooking (like braising) where it heats up as the meat does, but don’t use it to garnish or finish your dish after cooking. Reaction. High-acid foods and marinades can react with aluminum or anything that contains lead. Make sure to store your marinade in glass or food-safe plastic. If you want to make some delicious marinades that put into practice everything you learned here, these are some of my faves. What is your favorite thing to marinate? What is your go-to marinade that you always keep around? Tell me about it in the comments or show me on social media – @foodabovegold. If you used this post to help you learn how to marinate, make sure to tag it with #CallMeMichelin.